Last week Area Floors helped support Molly’s Fund Fighting Lupus Annual Serving Up Style event by hosting their first kick off meeting at Area Floors Showroom in Tigard, OR. Molly’s Fund is an organization that strives to educate the public and the medical community about lupus, to advocate for earlier life-saving diagnoses, to support people living with lupus and to collaborate with government and foundations to fund research toward a cure. This important organization was founded by Molly McCabe who found herself after much misery and mystery to be diagnosed with Lupus. Due to her experience, she created Molly’s Fund to provide resources for those that are afflicted with Lupus and their supporters and for those that treat people with Lupus. Of course part of their mission is to raise funds to support Molly’s Fund and all that it does. Their main fund raising events each year are Serving Up Style and Butterflies in the Park. 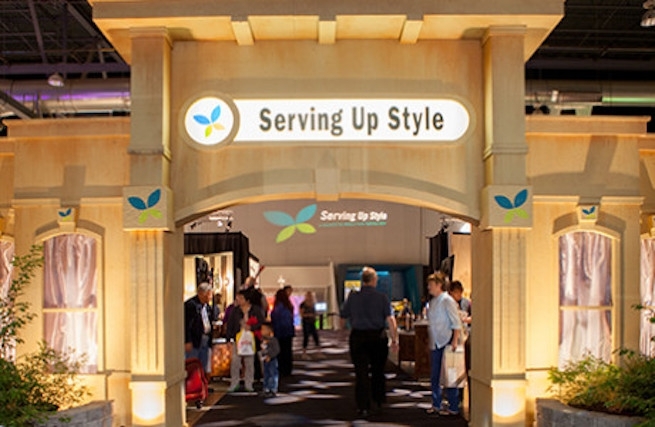 Serving Up Style is an event held in conjunction with the Fall Home and Garden Show at The Portland Expo Center, October 2nd through the 5th 2014. It is the premiere design showcase in the NW offering a four day event featuring some of the top designers in the industry. This years theme is focused on dining. Designers are encouraged to be creative with the dining experience. You might not even see a table and chairs in all of the design installments. Perhaps it’s an over the top tailgater or a lavish outdoor picnic. The sky is the limit! Also encouraged in this years designs is to find ways to make use of everyday materials – re-envisioned and re-purposed. In tandem with Serving up Style, Molly’s Fund hosts The Gala, a fundraiser that raises awareness and money to help support the programs offered by Molly’s Fund Fighting Lupus. At The Gala, a silent and live auction will be the main events followed by an award ceremony recognizing the most outstanding dining rooms. This is the largest event of the design community in Portland and Southwest Washington. Tickets sell out fast so don’t miss the hottest event of the year! In support of Molly’s Fund Area Floors has donated $500 off materials to design teams to use for their installments, as well as an all expense paid trip to Vancouver BC for one lucky designer that will be selected at random. That person will visit Kentwood Design Center, tour the city, enjoy a once in a lifetime float plane trip to a waterfall, and indulge in the local cuisine and culture. The winner will be announced on our Facebook page www.facebook.com/AreaFloorsOnline on April 24th! Area Floors is proud to serve our community by supporting such worthy charities such as Molly’s Fund. We are honored to be invited to participate in this event and hope to maintain a long relationship with Molly’s Fund. Together we can make a difference in the fight to treat and cure Lupus.